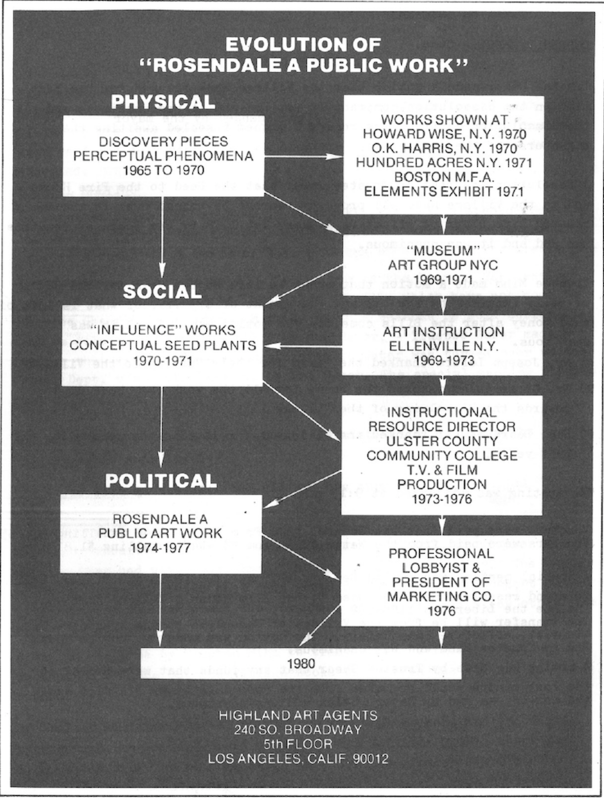 Back cover of the publication Beyond Art – Dissolution of Rosendale, N.Y., 1975–1976, (reprint, 2013). In 1975, Raivo Puusemp, a conceptual artist of Estonian origin, was elected mayor of the village of Rosendale, New York. His artistic practice was based mainly on “spreading ideas” realized by others. In seeking the mayor’s office, Puusemp seized an opportunity to use his artistic competence in a new field, to create “a work of art as a solution to a political problem.” In the 1970s the village of Rosendale was struggling with numerous infrastructure, tax, and administrative problems. In a referendum, it was decided to implement Puusemp’s concept of converting the village into a non- municipal area, lacking its own administration and municipal status, and thus the village passed into the jurisdiction of the neighbouring township (also called Rosendale). During his entire term, Puusemp never referred to his work as an artistic project (see: coefficient of art). After elimination of Puusemp’s civic office, the artist/politician, who enjoyed great popularity and support among the residents, moved with his family to Utah, where he ceased his art work and launched a ski business. The material trace of Puusemp’s work, entitled Beyond Art – Dissolution of Rosendale, 1975–1976, is a 30-page “catalogue” (presented at the exhibition) that compiles a set of press clippings on the “dissolution of Rosendale.” In the 1980s, the artist Paul McCarthy encouraged Puusemp to publish the work; he also financed the publication. The report presented in exhibition consists of two copies of the publication Beyond Art – Dissolution of Rosendale, N.Y., 1975-1976 (reprint, 2013), purchased from Project Arts Centre in Dublin by the Museum of Modern Art in Warsaw in January 2016.